Bicycles are a great mode of transportation. They are economical and good for the environment. While many areas of California have adopted more bike-friendly roadways, many areas are still heavily reliant on vehicle transportation. Vehicles are notoriously bad at sharing the road with bicycles. As a bicycle rider, it’s your duty to ensure your own safety. Just because you’re riding a bicycle, that does not mean the laws don’t apply to you. The police can pull you over for running a red light on a bicycle. The police can pull you over for running a stop sign while riding a bike. But the biggest reason to follow the rules of the road while riding a bike? Your own safety. If you’re weaving in and out of traffic, if you’re failing to abide by the rules of the road, you are more likely to end up in an accident, whether you’re in a car or on a bike. But remember, when you’re on a bike and in an accident, your injuries and usually more severe because you have less protection. Most bike riders adhere to the ABC rule of bike riding: Air, Brakes, Chain. Just as you would “kick the tires” before a long road trip in the family station wagon, making sure you check these items on your bike routinely and before venturing out on a busy roadway will help ensure your safety. Check to make sure your tires are inflated to the recommended amount. Make sure your brakes are working correctly so you can stop quickly, if needed. Also, make sure both the front and back brakes work. If you have to slam on the brakes suddenly but only the front brakes are working, you could end up flipping forward and causing additional harm to yourself. Finally, make sure your chain is well oiled, has no kinks, and is not broken. You will already be harder to see while riding a bike because the bike is much smaller than a car. Wear a bright colored or reflective jacket to increase your visibility to other drivers. During winter months especially, when the days are shorter, make sure you have reflective material or lights on your bike. You want to mimic cars: white lights in front and red lights on back. This way, just like cars, other drivers know which direction you’re heading just by seeing your lights. Despite the careful preparation and defensive strategies while riding your bike, accidents can and do happen. 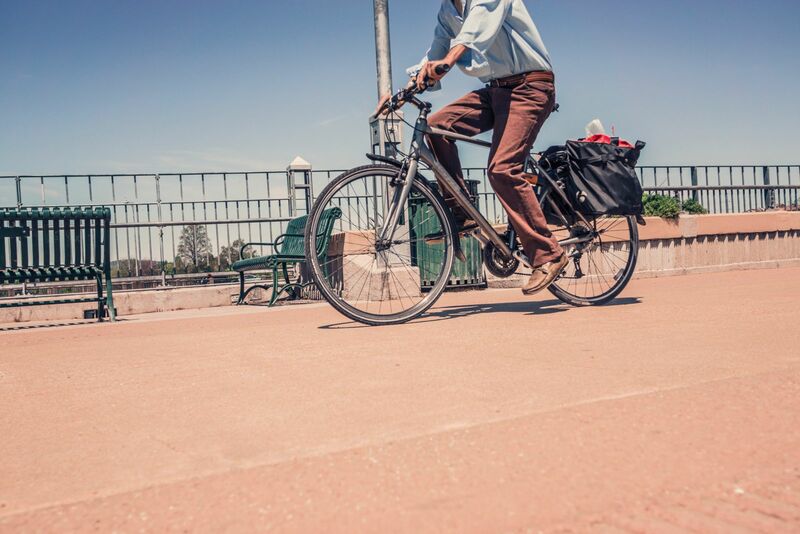 When you are injured while riding a bicycle, the injuries can be severe and costly. This is why you need the trusted team of Steinberg Injury Lawyers to be the vigorous representation you need and deserve. We can help you get back on your bike and get back to the life you love. Get a free, no obligation evaluation of your case by calling 800-989-6385.